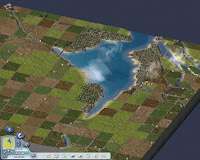 Sim City 4 is a city-building/urban planning simulation computer game. 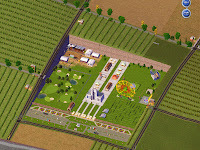 It is the fourth installment in the SimCity series. Sim City 4 has a single expansion pack called Rush Hour which adds features to the game. Sim City 4: Deluxe Edition contains the original game and Rush Hour combined as a single product. The game allows players to create a region of land by terraforming,and then to design and build a settlement which can grow into a city. Players can zone different areas of land as commercial,industrial,or residential development,as well as build and maintain public services,transport and utilities. For the success of a city,players must manage its finances,environment,and quality of life for its residents. Sim City 4 introduces night and day cycles and other special effects for the first time in the Sim City series.